This water resistant product has all the characteristics to help add both charm and value to any home! It is the perfect laminate flooring for all living areas, it's hygienic, durable and easy to care for and is perfect for bathroom or kitchen use. 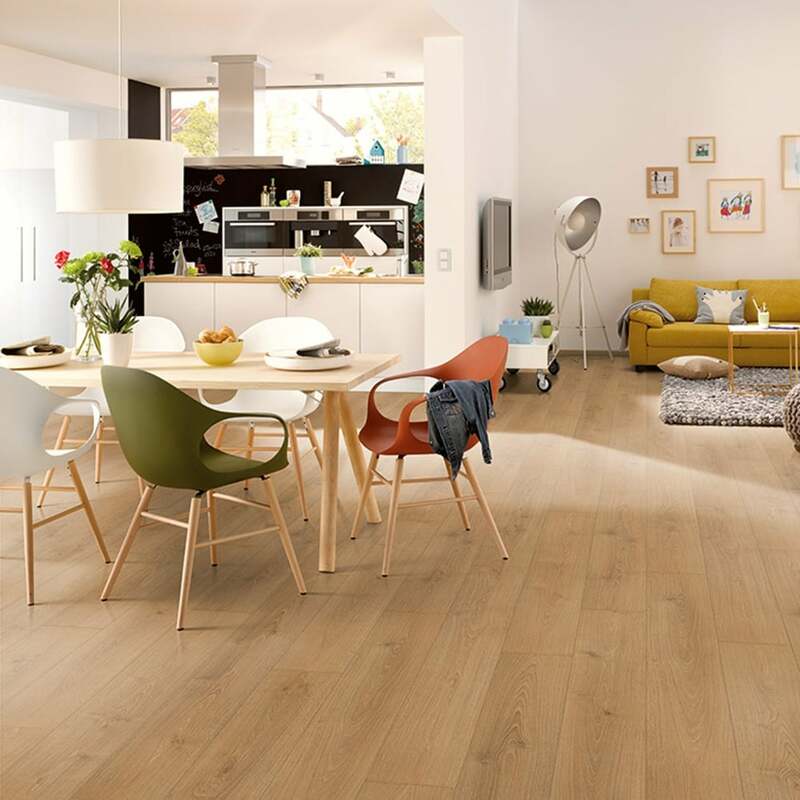 With an AC4 heavy domestic rating, and a 4-sided v-groove to help define each individual plank, this Oak floor will complement many interiors. The product is ideal for heavy domestic use and moderate commercial use and can also withstand the use of steam cleaners and other heavy water exposure without running the risk of de-laminating. Here at Discount Flooring Depot, we want to make DIY as simple as possible for you. With its easy to install click system, a new floor could be in your home quickly and installed with ease. Why not request a FREE sample today! Review Summary - 4.6 out of 5 based on 9 ratings. The colour is very nice and matches perfectly with what I have in the other rooms. The packs have arrived on the specified day and some of them were damaged. I have called the company and said that they will send a replacement packs. It matches with the colour of flooring from the other rooms. Good quality laminate. Realistic oak effect with a slightly textured surface. Excellent service from Discount Flooring. I ordered three laminate floor samples to get an idea of colours for my flooring. It's always hard to tell what things look like online so I was pleased this service was offered. So quick and easy! Free samples and delivery. Arrived in less than 48 hours, no problems at all. The flooring looks good quality, realistic wood effect. This colour is a classic oak effect that you see frequently, seems very popular. Not too dark but quite warm in tone. I have similar in my home at the moment and wanted to lean to a more neutral look. I was glad I got to see a sample in order to make that decision. This laminate is a medium light oak. Definately honey brown not orangey. Dull not glossy. Looks good like real wood and sample was cut so that you could see how easy it was to connect to other laminate sample pieces. Just marginally lighter than 'Northline'. This was one of a sample of three pieces of hydro guard laminate and looks to be of very good quality and gives a good idea of colour. Thank you.